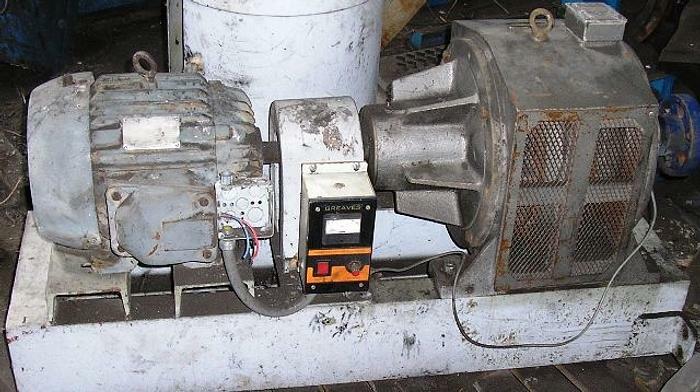 Greaves Variable Speed Drive: Model # 10235 OV :Rating 11 K.W. Speed 120-1200 RPM: S.R. 600 JA 354:F. L. Torque 7.13 KGM. Unit is powered by 15 HP. A.C. Induction Motor 230/460 Volts: 1750 RPM. Unit has GAC 40 Serial Adjustable Speed Controller. Clutch Excitation 85 VDC. Max. 2.5/5.0 Amps. Greaves LTD. Bombay, India.